You will have probably heard by now about tales of deforestation, with thousands of acres of beautiful tropical rainforest being razed to the ground with little regard for nature or human wellbeing. Deforestation not only deprives large land masses of stunning scenery and character; it also puts many animal species at risk of extinction and discommodes people living in these regions. Instead of knocking so much of our rainforest areas, we should instead treasure them and appreciate their natural splendour. 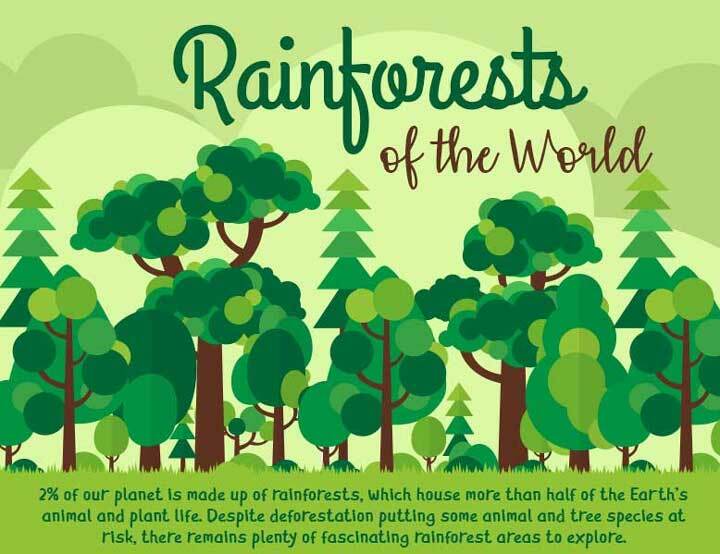 The infographic below, which was created by Jarrimber, profiles some of the world’s most precious rainforests, highlighting the plant, tree and animal life which exists in these forests and which could face extinction if the present rate of deforestation continues at such a worrying pace. From the Amazon which transcends almost the full width of South America, to the Congo Rainforest which spreads across nine African countries and the tourist hub that is Australia’s Daintree Rainforest, there remains plenty of magnificent forestry on this precious planet. Explore any of these regions and you’ll understand why deforestation feels so, so wrong.